JackpotJoy is a relatively new online casino launched in May 2006. 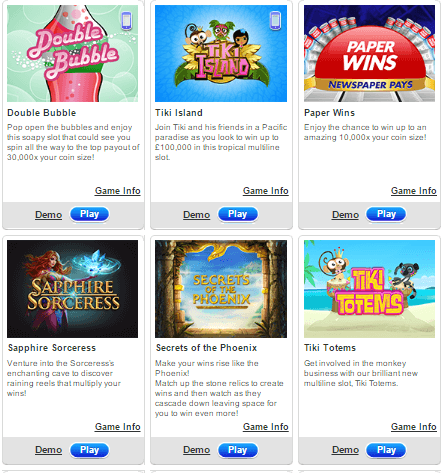 They have several unique and entertaining games on offer coupled with massive prizes. Their website has a categorical list of all games thereby providing ease in access to players. 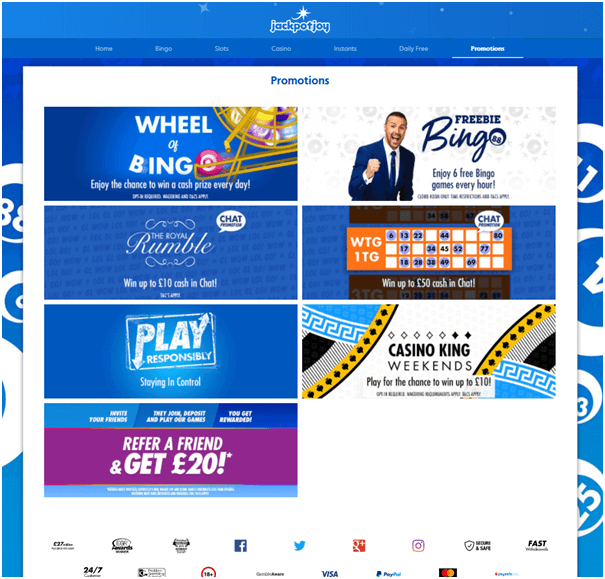 One of the supreme strengths of JackpotJoy casino is their website usability, all their games are listed on the site page with pleasant graphics, for this reason no deep exploration of site is required. Jackpot Joy casino operates like a variety show with several games, their offers are not only limited to cash and casino credits but also freebies such as music players, movie passes, household appliances, etc. JackpotJoy offers 100 different games, below are some of its well-known games to be enjoyed on your PC and Mobile devices. Arcade Games: Diamond Mine, Penalty Cup, Footballers` Widows, Rugby Hero, Scratchcard Shop, Jumpers for Goalposts, Cash Volcano. Bingo: Gold Bingo Lounge, Jackpotjoy Bingo 20, Jackpotjoy Bingo 100, Fortune Teller Keno, Badabingo, Seaside Bingo, Keno, The Price Is Right Bingo, Studio 1 Bingo. Slot Games: Las Vegas Dreams, Shopping Spree, King of the Jungle, Lucky Hearts, Pub Slot, Coral Reef, Luck Be A Lady, Fortune Temple and loads more. JackpotJoy runs its own proprietry software Gamesys, which requires no terminal window to download and members can play in real time. One of the famous tournaments at JackpotJoy casino is the Big Brother Tournament where players have a chance to grab up a top prize of upto £1,000 or bag a scratch card, which can also lead to loads of great prizes. Also avail 10% casino cash back offers and other daily and monthly promotions. JackpotJoy casino allows with any of the following deposit methods like Visa, MasterCard, FirePay, Neteller, Switch, and Solo to fund your casino account. There’s a quick Deposit button at the top of the home page or you can also go to Menu then My Account and click on Deposit Funds. The minimum deposit that can be made in a single transaction is £10. 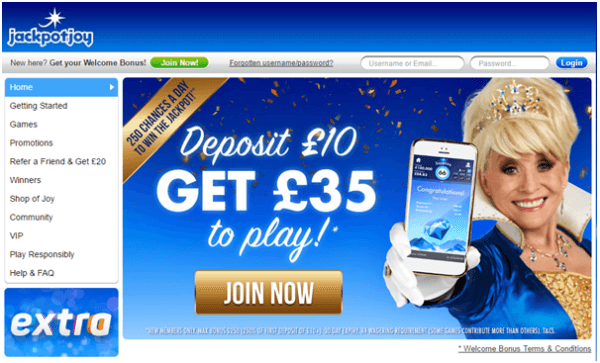 When you first make your Jackpotjoy account you will be prompted to register a new payment method. After this point you can access the Deposit page at any time, or quickly make a deposit via the ‘Deposit’ button at the top of each page of the website. To make a withdrawal just go to Menu > My Account > Withdraw and enter the amount you want to withdraw from your withdrawable balance. The minimum amount you can withdraw is £10. The maximum amount that can be processed in one transaction depends on your withdrawal method. Withdrawals are available 24 hours a day, providing you have at least £10 on your balance and as long as you’re not bound by a bonus wagering requirement and you have no outstanding verification requests. Each withdrawal takes between 4 and 24 hours to be processed by Jackpotjoy. Each withdrawal will then be subject to its own clearing timescale, dependant on the method used. If you have any questions or simply want to find out more about VIP, you can contact the casino on 01782 381633 or email vip@jackpotjoy.com. The friendly customer support team at Jackpotjoy is available 24/7 to assist you via live chat, email and phone. You can also contact a Chat Host in one of the chat rooms, as they are often available to answer any of your queries.